Ronnie O'Sullivan secured a 4-2 victory over world number 105 Sanderson Lam after slipping behind early on in their first-round clash at the Welsh Open in Cardiff. The five-times world champion - winner of the Welsh Open in 2004, 2005, 2014 and 2016 - began the match slowly with a number of errors as Lam assumed the early control with a 2-1 lead. But the Rocket responded in stunning fashion with brilliant back-to-back breaks of 95 and 116. He was denied a century due to a foul after not waiting for the referee to re-spot the pink in the fourth frame, but made up for it in the fifth, bringing up his ton with a brilliant double on the blue. "Just to answer all the tweets asking me why the century didn't count for Ronnie," said referee Brendan Moore on Twitter. "Spotting a colour is part of the stroke. As Ronnie played the next stroke before the spotting was complete, the foul is on the pink, that's why the break was 95 and a foul 6 to Sanderson." 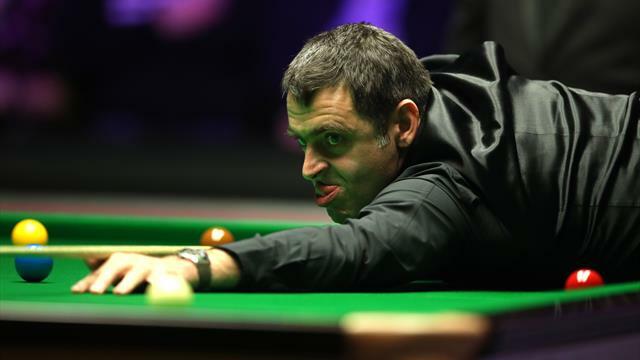 It was a fine reaction from O'Sullivan, who was not in vintage form in the opening-round match in Cardiff. A scrappy sixth frame saw the Englishman close out victory and take his place in the second round. The highlight of the evening session came in the fourth frame of Neil Robertson's 4-1 victory over Jordan Brown when Australia's leading player knocked in his fourth career maximum. The 2010 world champion was in devastating form as he watched Brown win the first frame with an 88 before producing sparkling knocks of 77, 147 and 140 to breeze through to the last 64. World number one Mark Selby completed a 4-2 victory over Anthony McGill with breaks of 139, 75, 61 and 80 enough for the three-times world champion to progress. McGill pieced together 74 and 105, but suffered another disappointing early exit. German Masters champion Kyren Wilson sped to a 4-0 victory over world number 119 Andy Lee, making breaks of 63, 88, 67 and 60 in completing a one-sided win that lasted only one hour and seven minutes.